Inchies are tiny, creative one-inch squares (2.54 x 2.54cm), and are a new and growing trend in the world of mixed media art. They are perfect for giving your imagination a free rein and for trying out new techniques and materials. You do not need a huge supply of fabric, yarns or embellishments, and most can probably be found in nature, or scattered around the home. 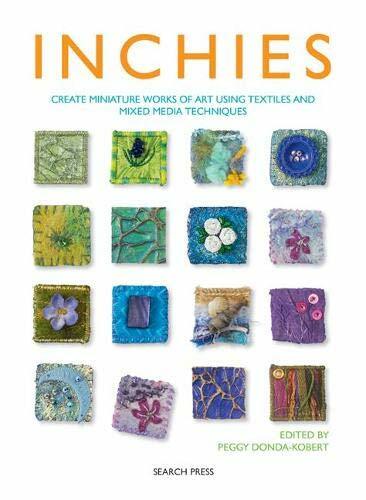 In this book, different authors present a range of techniques and designs that will excite and inspire you to create your own versions of these miniature pieces of art. Build up your own collection, transform them into tiny boxes or unique items of jewellery, or use them to decorate bags, purses and keyrings. The possibilities are endless! Even as a child, Peggy Donda-Kobert was fascinated by fabrics. Her grandmother, who was a dressmaker and haberdasher, inspired her to start collecting tiny pieces of fabric. Initially making clothes for her dolls, she later went on to design her own clothing. In 2002, she became involved in traditional patchwork and later art quilts. Since then her work has become more experimental, and she enjoys working with smaller media such as ATCs (Artist Trading Cards), AMCs (Artist Mailing Cards) and inchies. She now runs creative workshops on inchies and has set up an internet group on the subject.